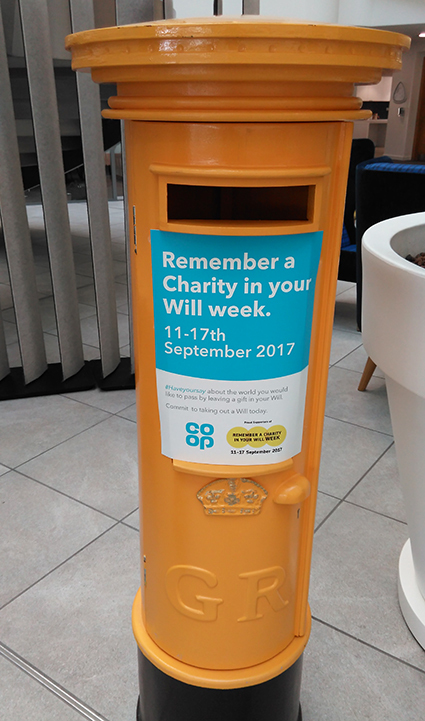 The official partnership between Remember A Charity and Co-op Legal Services has brought two like-minded, trusted and ethical organisations together to promote the importance and benefits of writing a Will and, in doing so, encourage more people to leave a charitable legacy. As part of the partnership, Co-op Legal Services’ team of qualified Will-writers, headed up by a senior solicitor, will always ask customers to consider leaving a charitable gift in their Will after taking care of friends and family. It also supports a range of initiatives, including Remember A Charity Week, to help raise millions a year for good causes. The partnership won Third Sector Business Charity partnership of the year in 2014 for its “outstanding” work. Co-op Legal Services is part of the world’s largest consumer cooperative, The Co-operative Group.